Microsoft Edge is the default Windows 10 internet browser from Microsoft. It comes pre-installed with all Windows 10 versions, performance wise it’s a significant leap compared to dreaded Internet Explorer web browser that was marred by sluggish speed and lack of features essential for any modern internet browser. If you are still on Windows 7 then you can easily replace Internet Explorer with Microsoft Edge. For those new to Microsoft Edge there is plenty you can do to improve web surfing experience with Edge. However, being a new internet browser it is not impervious to occasional bugs and minor issues that can affect the normal functioning of the browser that also meddles with user experience. If for some reason you notice that Edge internet browser is not performing optimally, crashing unexpectedly or failing to load pages then it is time to repair Microsoft Edge on Windows PC and laptops. Edge is the stock app in latest Windows 10 and cannot be simply removed and reinstalled like other apps. There are more complex but sure shot ways of fixing faulty Edge browser, however, before moving on to them let’s start with the simplest method for addressing the problem and see if it stops the problem in its tracks. First way of tackling the issue is to open the Edge browser on you computer and follow simple instructions below to see if that fixes the problem. All done. Now close the browser and open it again. Hopefully it solves the problem and Microsoft Edge will be back to normal. If it doesn’t work then move on to the next solution below. It will scan system files of which Edge browser is also a part, hence, if there exist any fault with it you should see it now on the screen and take appropriate remedial action to fix the problem. If even this doesn’t work to bring Microsoft Edge back to normal then follow guide below which will certainly restore Edge back to normal. If all else fails then this last solution will dissect the problem by going to the core and bring Microsoft Edge back to life with all functions rejuvenated and ready for use. Please note to backup all data or create system restore point before going ahead with this method as a precautionary measure against any mishap since we will be dealing with system codes and files. Backup is a must before proceeding and follow the instructions at your own volition. 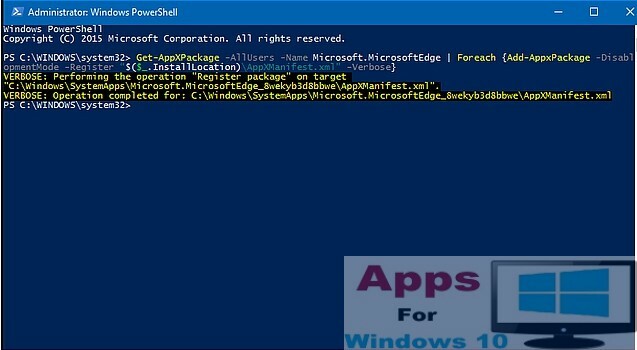 When PowerShell windows opens, copy and paste the code given below in it and hit enter. You should see the following screen after entering the code in the last step. All done. Close the window. Microsoft Edge should be fully functional and back to original default settings. Make note of the error code and see solutions related to it in the link here. Enjoy the best internet surfing experience with new and improved Microsoft Edge web browser.